Spring break is our favorite time to get away with the family, an ideal time to travel affordably between the pricey winter holidays and crowded summer months. Before the crowds hit the beaches and mountains for summer vacation, spring break is a treasured time for getaways for most American families. Vacations between February and April also can be easier on your budget and easier to plan. These days, you likely will find more families on spring break—often with grandparents in tow—than college kids. We are joining our colleagues at Family Travel Forum to recommend getaways that are guaranteed to please, whether you’re planning a reunion of several generations, a wild time with a bunch of friends, or some “we” time with loved ones. We hope you’ll find this roundup of the top adventure, beach, resort, cruise, festival, city, historical and international short breaks a helpful starting point. Why is spring break such a wonderful escape? Maybe because you’ve been working so hard all year. Maybe because you get to feel the sun on your shoulders after being cold for months. Or maybe because you get to spend a week making great memories with your family. Here are 24 fresh destinations and family adventure ideas selected with our partners at TakingtheKids.com. Whatever appeals, remember that things can go awry during even the best-planned trip, which is why travel insurance is an absolute must for spring break trips (of course, terms, conditions and exclusions apply).Before you forget: get a quote for your vacation! The alternative spring break movement began on college campuses and today, many non-profit organizations organize volunteer vacations where you can work together on sustainable projects. Start local; once the kids are ready, opportunities for volunteering are varied and exist in countries throughout the world. It’s the city of the hour with the Super Bowl coming Feb. 3, 2019, yet this Georgia peach is always busy because of Atlanta’s family attractions. Practice your own football skills at the College Football Hall of Fame, meet dolphins at the Georgia Aquarium, explore the human condtion at the multimedia National Museum of Civil and Human Rights, or get out in Centennial Park and admire the view. Craving a taste of spring with that dose of culture? Head to the 83rd annual Atlanta Dogwood Festival April 12-14, and join 250,000 other festivalgoers at art shows (including the best local high school work), international performances, midway rides and a “Backyard Bites & Brews” food fest; Family Friday offers big discounts on admission and rides. City universities and colleges come in all shapes and sizes, with personalities your kids will pick up on during a campus tour. Remember that children get a better feel from a campus tour when school is in session, so plan your travel dates accordingly. If you are interested in more than 28 institutions of higher learning, head west to San Francisco, a good base for touring UC San Francisco, “Cal” (UC Berkeley), Stanford, the Jesuit Santa Clara University and University of San Francisco, plus many others. Book ahead to find a deal at San Francisco’s top family hotels for spring weekend specials. Eileen Ogintz’ Kids Guide to San Francisco will help younger sibs plan fun activites at the city by the Bay. And whatever the kid’s ages, San Francisco is a foodie’s paradise. All-inclusives can be a great bet, whether you are traveling with young kids, tweens or teens or girlfriends, as I was recently at the Grand Residences Riviera Cancunin Porto Morelos, just a 25-minute drive from Cancun International Airport. Families raved about the staff, the food and the kids’ activities. Karisma Hotels & Resorts, also on the Riviera Maya with their beautiful white sand beaches, offer deals as much as 50 per cent off. Their resorts designed to suit different age kids and family groups include Generations Riviera Maya by Karisma that is meant for multigenerational groups, with expansive suites from one to three bedrooms. If you can tear yourselves and your kids away from the pool and the beach, there is the chance to visit ancient Mayan ruins in Tulum, snorkel in the world’s longest underground rivers or the world’s second largest barrier reef. Feast your eyes and learn about our cultural ties to Japan during the National Cherry Blossom Festival (Mar. 20-Apr. 14) which includes a special Blossom Kite Festival on March 30. There are more free attractions than in most other cities and it’s also a great base to explore programs at the 20 colleges and universities in the area. Dr. Martin Luther King and the Civil Rights Movement are the focuses of new exhibits at National Museum of American History and at the Newseum. Another option that celebrates the presidency is having tea with Martha Washington at Mount Vernon, just outside of Washington on select dates from Jan. 9-Mar. 9. You can get the new edition of Eileen Ogintz’ book “Kids Guide to Washington DC” and let the family lead the way. Even if the government shutdown returns, there is still plenty to see in DC! Cruises are always a good option for relaxing reunions because supervised programs for infants, tots, kids and teens – not to mention the scheduled bridge games – keep everyone in the family busy. Carnival Corporation, with its diverse portfolio of brands and nearly two dozen U.S. homeports, has cruises at every price point including the famous transatlantic Cunard Line, ideal for crossing the pond on a multigenerational trip. For those thinking of a Caribbean Cruise, Holland America, long popular with multigenerational groups, debuts the 2,666-guest Nieuw Statendam with purpose-built staterooms for families and solo travelers in February, 2019. It will be sailing the Caribbean this spring, featuring BBC programming, the line’s luxurious amenities and 19 different workshops presented with “America’s Test Kitchen” so guests can hone their cooking skills. After a nearly $200 million bow-to-stern makeover of Carnival Triumph, the totally transformed ship renamed Carnival Sunrise will re-enter service with a variety of voyages in the spring of 2019 and programs including Seuss at Sea; Hasbro, The Game Show and the WaterWorks water play area. Carnival carries more kids than any line in the industry. Our Family Cruise Sectionhas reviews of the major cruise lines and their family offerings. Family spring break programs are the rage at the major U.S. theme parks and water parks, where all ages can find thrill rides, themed attractions and live shows to their taste. No need to travel far; most of the local parks open with spring and Easter themed weeks in preparation for the summer crowds and many offer great season pass deals. Amusement parks are especially welcoming for those with special needs too. By the way, couples with babies in tow can take advantage of the Rider Switch policies at the major theme parks, which allow one parent to wait with baby at the head of the line while the other one rides, then switch without waiting again. Denverites are perplexed that family visitors don’t spend more time in Denver before heading to the mountains, especially with so much green space everywhere and sunshine. The Denver Art Museum offers kids’ activities in most every gallery and free backpacks to borrow with more interactive games inside. At the Denver Museum of Nature & Science you can virtually climb one of Colorado’s famous “fourteeners,” mountains that are more than 14,000 feet high, or conduct experiments in the Science Kitchen. We love the thoroughly interactive History Colorado Center, complete with a time machine that helps you explore Colorado in different times. Hipster parents love The Maven, two blocks from Union Station and adjacent to the Dairy Block with plenty of local eats with take-away and dine-in options (Skip the car while exploring Denver and take the 37-minute train back and forth to Denver International Airport—just $10.50 fir adults, $5.25 for seniors and $3.20 for students!) Walk or rely on Uber or Lyft and there’s plenty of green space everywhere! If you want to head to the mountains, take Amtrak’s ski train right from Union Station to the base of Winter Park on weekends. The popular Disney California Adventure Food & Wine Festival returns to Disneyland in Anaheim from Mar. 1-Apr. 23, 2019. The culinary marketplaces will present unique food and beverages, celebrity chef demonstrations, live music and a complimentary Junior Chef experience with hands-on fun led by Chef Goofy, for children ages 3-11. Guests are thrilled with the new themed food offeringsat the re-imagined Pixar Pier. Adventures by Disney has new Southern California land packages available to add on to 2018 Disney Cruise Line vacations setting sail from San Diego. ABD’s new cruise vacations for 2019 include all-new sailings down France’s Seine River for spring break and other European rivers. Take a break from the norm this spring and treat your family to a one-of-a-kind authentic vacation at a dude or guest ranch. There’s much more to do than just horseback riding, with hiking, fishing, kids’ programs and other adventures, everyone in the family will have a great experience on a dude ranch. Located in both warm climates like Arizona and cold climates like Wyoming and Oregon, spring breakers can choose to experience the “Old West” while basking in the sun or bundle up for a romp in the snow. No matter which climate you prefer, visit the Dude Ranchers’ Association to find the perfect guest ranch for your next vacation. And if you are already looking towards summer, it’s never too early to book your summer stay! Look ahead in spring to plan the perfect grandparent-grandchild vacation for this summer. Road Scholar offers grandparents an escorted learning experience from 5,500 different adventures in 150 countries and 50 states, guaranteeing travel memories all ages will treasure. One of the more thrilling offerings for summer of 2019 is authentic camping adventures in National Parks led by naturalists and expert local staff, for Road Scholar participants and their grandchildren (ages 8-18.) Read more about the variety of exciting programs on TakingtheKids.com (read our blog here and Family Travel Forum’s post here). If baseball rules in your household, take your team to spring training, a mainstay at small stadiums in Florida that host the Grapefruit League, and at Arizona’s Cactus League parks. In Peoria, Arizona, spend the afternoon watching the San Diego Padres or Seattle Mariners get into form. Tickets start at $9! These are only two of the 15 Major League teams playing more than 200 games between Feb. 21-March 26 in and around Greater Phoenix. The city has plenty of great family resorts and the kids will love a night vision Jeep tour of the starlit desert and its nocturnal creatures. Here’s an account of a family’s experience checking out the Cactus League. If you are trying out a new sport or outdoor skill during spring break, make sure to reinforce it during the summer so that it becomes an ongoing part of your family’s fitness routine. Spring is Holland’s most festive season, the time when tulips are in full bloom at Keukenhof Gardens and visitors can catch the latest museum shows. Families with younger children will love the Innovation Gallery at the NeMo Museum for science, and the viewing booths at the Eye Film Museum (open until midnight), whose ship-like architecture stands out on the harbor. Among the many Amsterdam attractions for families is the small Hermitage Amsterdam, where traveling shows from the extraordinary palace museum in Moscow go well with a delicious lunch in the picturesque outdoor garden. Japan is topping many of the “Where to Go in 2019” lists since the Japanese Yen has remained low against the U.S. dollar and the country has recovered from recent natural disasters. While most first-timers will want to visit the anime museums and animal-mascot cafes of Tokyo, we urge famiies to get out to the countryside. Nearby Nikko is the place to enjoy the cherry and pine trees coming back to life, a historic theme park where kids can dress up, noodle-making workshops and more, amidst this serene city’s traditional architecture and stunning temples. Kids can explore Japanese pop culture at the International Manga Museum in Kyoto and see more than temples on bike tours with locals. If you have always wanted to take your kids to see the sights of London, spring is a good time for your wallet and may be warm enough to enjoy a boat ride on the Thames River. Greenwich, a half-hour trip up the Thames, is home to the Royal Observatory, the National Maritime Museum, the Cutty Sark and the famous Greenwich Market, the best bet for souvenirs and a bite. During the U.K.’s school breaks, take advantage of extra programming for kids at already free museums. London’s Imagine Children’s Festival runs Feb. 13-24 with theater, crafts and storytelling events geared to toddler through age 12, many of them free. Use The Grange Holborn’s SCHOOLHOL coupon to get a School Holiday package starting at $150 per night, valid Feb. 17-24. It includes free continental breakfast for all, free kids meals when they dine at the hotel’s restaurants with paying adults, access to their beautiful swimming pool (plus spa, sauna and steam for adults) and tickets to your choice of one of the three Royal Palaces. New Orleans is famous for its huge Mardi gras celebration. NOLA honors its rich immigrant past and the blend of French, Spanish and African cultures that spawned Mardi Gras, which is comprised today of 135 yearly festivals including more than 35 Second Line parades. In addition, there are street festivals, concerts, commemorative displays in museums and around town. Notice signs of development including a new airport, a revitalized riverfront, and a focus on the city’s medical industry and infrastructure all over town. The big day is Tuesday, March 5, 2019 and, even if you’re not in New Orleans, there is always a party somewhere as you can see in our roundup of the world’s top 15 Carnivals. Did you know there are approximately 850 million museum visits each year? That’s more than the attendance for all major league sporting events and theme parks combined according to the American Alliance of Museums. Families don’t have to spend their time only at children’s museums, but one of our favorite places is The Children’s Museum of Indiana, and it’s a great centerpiece to an Indianapolis getaway. Learn a new sport at the Riley Children’s Health Sports Legends Experience, a 7.5-acre campus next to the current museum celebrating its first birthday in March. With indoor and outdoor activities, it’s an all-weather facility designed to introduce kids to motion, recreation and responsibility for their own health. Journey into the Great Unknown with OARS, the legendary outdoors company celebrating 50 Years of Adventure in 2019. They’re pioneers in taking adventurous families into a secret world of hidden canyons and spectacular scenery on all-inclusive adventures led by top-notch guides. All you and your family need to do is show up! Here is your chance to disconnect from the stresses and strains of daily life and embrace splashing rapids as you paddle through America’s canyons less traveled at the heart of the Colorado Plateau. All ages will live and breathe the legacy of John Wesley Powell, one of America’s greatest explorers of all time. This time around, the expedition is yours. What will you uncover? Two and a half million visitors during the season make Orlando one of the country’s top Spring Break destinations, and the variety of teen activities is one of the reasons. No matter what your budget, there is a flight, train or bus on its way there right now and there are hundreds of hotels to choose. Check out hotel deals and special theme park ticket offers for Canadian visitors in nearby Kissimmee and, if you want to save on hitting all the major theme parks, consider the new Orlando CityPASS, a discount ticket booklet that gets you first in line privileges. Despite the damage caused by the partial government shutdown that kept many park rangers from their duties earlier this year, the National Parks are our treasures. This year, thanks to Every Kid in the Park program, 4th graders and their families can again visit all national parks, designated lands and waters at no charge. Order your parks pass online and help the national parks reach their goal of attracting 500,000 children this year. And make sure the kids sign on to become Junior Rangers! Princess Cruises first began sailing to Alaska in 1969 with Princess Italia carrying 525 guests to this breathtaking bucket-list destination. This year, the leading cruise line in Alaska is celebrating its 50th anniversary sailing by introducing new entertainment, shore excursions, culinary and retail offerings. New Alaska programs will be available onboard seven Princess Cruises shipsfor the upcoming May through September season, including the debut of Royal Princess, the largest ship ever deployed to this region, carrying more than 3,500 guests. Special activities include guest speakers, a new Northern Lights Planetarium onboard, special “Glacier Tea” cocktails and Alaskan-themed Chef’s Table, among others. This year’s Carnaval de Quebec is the week before the President’s Day break, Feb. 8-17, 2019, with more than 150 events and competitions taking place over the over 10 days. Long a favorite multigenerational affair, Canadians have celebrated winter and their beautiful city with the puffy white mascot, Bonhomme, who appears for meet n’ greets at several venues. Now, in addition to outdoor vendors, ice canoeing, races, snowshoeing, sleigh rides and hill climbing, the Videotron Music Box will stage almost 20 live, next generation shows with a mixologist on hand at the rustic Jos’ Cabin. Throughout the extensive grounds, warm up tents are packed with kids dance parties, workshops and crafts events. Do not miss the ice and snow carving demonstrations; Bonhomme festival passes are sold online and at the venues. And if you want to get active this spring, there are several family-focused alpine and snowboard mountains, plus cross-country ski resorts, within an hour of the city with their own shuttle services. With buzz about successful Space X launches, Virgin Galactic’s progress toward manned sub-orbital flights and “LEGO Movie 2: The Second Part” battling aliens when it opens Feb. 8, it is time to plan your trip to outer space. The celebration of Apollo 11and the 50thanniversary of the moon landing has already begun in Huntsville, Alabama. Although July 19 is the actual flight day, commemorations have already begun at the U.S. Space and Rocket Center, art museums and more. How many websites do you have to visit to plan the perfect family ski or snowboarding vacation? In spring, it is all about the weather and conditions at your destination. Check out our annual roundup of the Top Family Snow Sports Resorts for dozens of destination ideas to help you plan a spring break skiing or snowboarding adventure. And if you only need one idea, head to the self-styled “Spring Skiing Capital” at Squaw Valley Alpine Meadows in Lake Tahoe – here are a dozen reasons we love Squaw Alpine now. 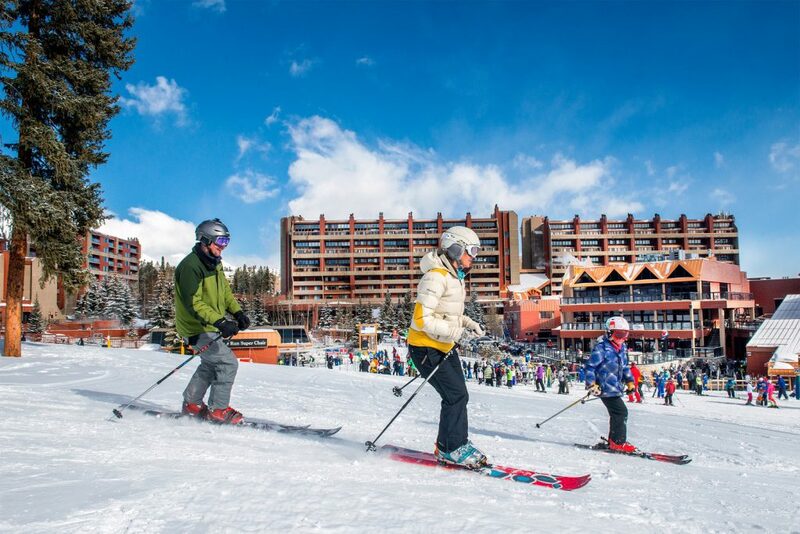 And if your family are beginners, consider a smaller, less expensive resort like Breckenridge, which has just announced it will remain open until Memorial Day! A good dog-and kid-friendly option is the slopeside Beaver Run Resort that is offering good late season discounts. Ski Butlers brings the equipment to right to you and makes sure everything fits before you hit the slopes! In terms of ski and snowboard gear, let us share some wisdom. As critical as your gear is, most of it can be rented. If you prefer to travel with your own, keep in mind that expert families usually carry their customized boots and rent the latest model performance skis or snowboards on arrival. For the ultimate convenience, Ski Butlers delivers all your ski and snowboard equipment rentals directly to your accommodations at 47 Resorts in Colorado, Utah, Wyoming, Idaho, Montana, California, British Columbia Canada and France., fitting you and your family right there—no need to wait in line at a rental shop! The company will swap out your equipment, meaning if you have any issues with your gear, would like to try a new ski or boot, etc they will meet you within 45 minutes of a phone call at the resort. At the end of the rental, they pick everything up after your final ski day, Kids rent free in Telluride, Steamboat and Sun Valley with a matching adult package. With over 228 inches of snow so far this season and a whole lot more on the way, this spring is shaping up to be an incredible time to plan a ski vacation in Breckenridge CO. Ample snowpack, fresh powder and bluebird days will make for the best March and April the mountain has seen in decades. Numerous activities and events in town – from Spring Fever to the Breckenridge Beer Fest – make for even more fun when you’re done skiing for the day. Access everything Breckenridge has to offer this spring when you stay at Beaver Run Resort & Conference Center. Their ski in, ski out property is just a short walk or shuttle ride to town and there are more than enough amenities on-site if you opt for a day in. Enjoy up to 40% off when you book today. America’s 50th state is a great destination for outdoor adventures, especially the Big Island of Hawaii with its diverse habitats and eco-systems. Remember the 2018 eruption of Kilauea and the terror of families who had to flee their homes? After several months of apparent dormancy, tour operators are again leading hikes across lava fields to a new beach. Did you know your family can also swim with manta rays in the dead of night and summit the world’s tallest mountain for stargazing? Check out 3 Bucket List Adventures to Check Off in Hawaii and start planning for spring. We hope you’ll use our guide to make your spring break or summer vacation planning easier — and please share your own discoveries below. I can totally relate to this post! I find it easier these days than ever before to get great value travel. I did not know anything about the jr ranger programs or the grandparents programs. Thanks! Spring is a time to visit new places with the family as you need to make wish list before travelling to new places and care about their cultures and rules, regulation of the country which you are going to visit.